Joining the F35 and SRW-9000PL in Sony's lineup of CineAlta 24p digital cinema cameras, the PMW-F3L Super 35mm XDCAM EX Full-HD Compact Camcorder with S-Log Gamma continues the democratization of high-end image capture. The camera's Super 35mm-size CMOS sensor offers a variety of advantages over smaller sensors, including increased control over depth of field, higher sensitivity in low light, lower image noise, and an exceptional dynamic range. Unlike smaller, broadcast-style sensors or the larger "full-frame" sensor found in some DSLRs, the PMW-F3's chip is on a par with Hollywood film cameras, in terms of field of view and depth of field. That means complete compatibility with cine-style film lenses and consistency of vision for cinematographers used to shooting on 35mm film. Another advantage of the camera's highly efficient sensor is its low power consumption--only 24W. Not only does this mean a standard 12V battery can last nearly 3 hours, but the low amount of heat the sensor generates offsets the need for an internal fan--contributing to the camera's extremely light weight (just over 5 lb). As a result, this is the first CineAlta camcorder designed with a handheld form factor. Using a solid-state workflow based on the XDCAM EX platform, the PMW-F3 records natively to professional SxS media, using the MPEG-2 long GOP codec in an 8-bit 4:2:0 color space. More demanding applications can utilize the camera's dual-link HD-SDI ports to output to an external recorder in 10-bit 4:2:2 or 10-bit RGB 4:4:4. The combination of four HyperGamma settings with S-Log and LUT capability provide RAW-like flexibility to the image data, allowing for increased picture control and dynamic range. S-Log expands the camera's dynamic range to include at least 12.5 stops of exposure latitude. Meanwhile, the F3's Exposure Index mode sets the camera at an optimal ISO and adds a full stop of exposure, maximizing the sensor output for situations when highlights are a priority. An included PL mount adapter strengthens the link between digital cinema and traditional film, providing an efficient means for using any number of professional PL-mount cine lenses--including full compatibility with Cooke/i and Arri LDS technology. Beneath the removable PL adapter, the camera's native, stainless steel FZ mount provides a foundation for added versatility. Its short flange distance allows for the development of smaller, lighter zoom lenses as well as compatibility with a wide array of both cine and photo lenses (using optional adapters). 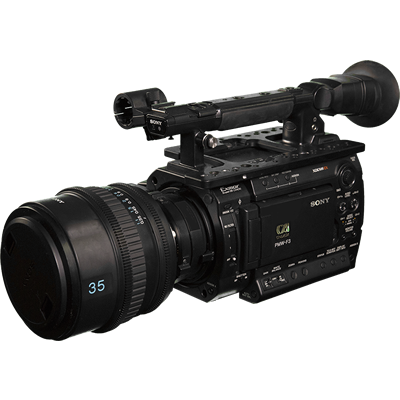 Other features--such as variable frame rates, multiple-format recording, slow shutter, and uncompressed PCM audio--make the PMW-F3 an impressive companion to its larger Super 35 brethren. 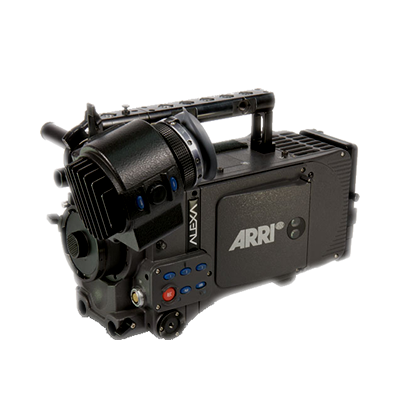 Not only will it intercut perfectly with the F35 and SRW-9000PL as a second unit or B camera, it can easily stand on its own in applications as diverse as indie film, television, commercials, music promos, and education. In the world of digital cinema, these are indeed interesting times--and the PMW-F3 represents another revolutionary stride toward affordable, motion-picture quality imaging. The Sony PMW-EX3 is a flash-memory based high definition camcorder capable of a variety of frame rates and resolutions using Sony's new XDCAM-EX intraframe codec. A "big-brother" to the PMW-EX1, the PMW-EX3 ups the ante by providing an interchangeable lens mount. The mount allows users to put a variety of professional lenses on the camera, including 1/2" and 2/3" bayonet mounts (with optional adapter). Enhancing both usability and workflow efficiency, the PMW-EX3 has an extensive set of features that push the boundaries of traditional handheld cameras, including a continuous record time of up to 140 minutes! Whether shooting in 720p, 1080i, or 1080p modes, the PMW-EX3 has it all covered. Its bevy of output settings lets users take advantage of fast and slow motion, as well as popular frame rates such as the "film-like" 24p mode. Sony's XDCAM EX lineup continues to expand and improve with the PMW-320K Full HD Camcorder. Nearly identical to the larger-sensor PMW-350L, this professional shoulder-mount camera boasts three 1/2"-type full-HD CMOS sensors, solid state SxS workflow and an impressive set of advanced features, setting new standards for affordable, high-end videography. 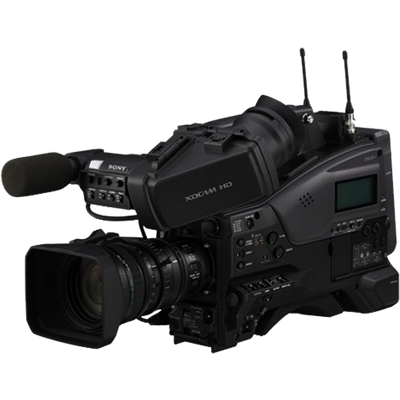 With a chassis based on the XDCAM HD422, the PMW-320K also manages to be one of the lightest--and most well-balanced--camcorders in its class (even factoring in the included 16x interchangeable Fujinon lens). But comfort and portability are only the beginning. Pressing the Record button reveals what the PMW-320K is really about: topnotch image quality. And this camcorder comes by it honestly, whether in its High Quality 35Mbs HD setting or using the optional 25Mbs DVCAM recording mode. Either way, your images are captured quietly and efficiently to SxS PRO or the new, lower-cost SxS-1 memory cards--storing up to 280 minutes of MPEG-2 HD video on two 32GB cards. You can even record uncompressed 4:2:2 video by capturing to an external recorder via the camera's HD-SDI output. Exceptionally low power consumption (down to 15W) means the PMW-320K can run on a single 90Wh battery for up to 5 hours, which is not only good for the environment, but fewer batteries mean less weight (and lower costs) on long-distance shoots. Other features--some passed down from Sony's higher-end F900R and PDW-700--are also worth highlighting, including scene file settings, adjustable gamma, and Matrix settings that can be stored on memory cards. Four channels of audio and a viewfinder that incorporates the EX1/EX3's entire high-resolution LCD screen (and adds image flip) make the shooter's job even easier. 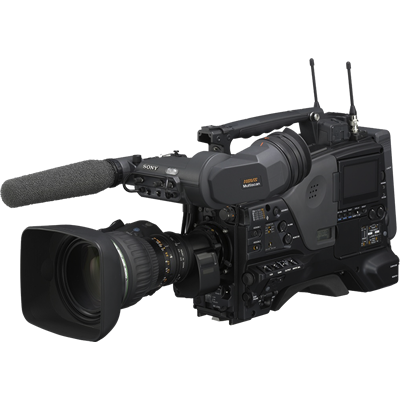 With the introduction of the PMW-320K, Sony reaffirms its XDCAM EX cameras as serious high-definition contenders. EPIC ushers in the next generation of digital cinema, featuring a 5K sensor capable of capturing 1 to 120 frames per second at full resolution. From fashion spreads to 3D IMAX features, EPIC has crossbred elite photography with unrivaled cinema capability—all in a camera the size of a DSLR. In challenging lighting conditions, EPIC makes it easy to adapt with its ability to reach up to 18 stops of dynamic range with HDRx. Remarkable technology packed into a 4lb body - with EPIC, less is more. Consistent with RED’s high-resolution lineage, EPIC has made large format distribution accessible and easy. 5K images make it possible for you to streamline your footage for IMAX applications, giving you the most resolution for stills and motion workflows. No matter the size of your project, 5K gives you every opportunity to be EPIC. All ALEXA cameras provide the best looking digital image with the least amount of fuss. They all have the same high end optical low pass filter, a custom made CMOS sensor and custom electronics and processing software. These components are carefully designed to produce images with the organic look and feel of film. The sensor provides an unequalled exposure latitude of 14 stops with special consideration given to highlight treatment. Creating a good looking roll-off in the highlights is probably one of the most difficult tasks for any sensor designer and we have spent enormous resources at insuring exceptional highlight handling. ALEXA's high sensitivity and its ability to hold up very well even when extremely under or overexposed make it very easy to work with. ALEXA’s color processing was developed by our own color scientists (who are the same people that have been working on the ARRILASER and ARRISCAN, so are intimately familiar with both film and digital color science) to render clean and natural colors, especially noticeable in ALEXAs great looking skin tones. ALEXA represents the most efficient and versatile method to capture and then transport images, audio and metadata through the production process. This is achieved with a multitude of output options, support for the native codecs of the most popular non-linear editors, complete metadata and integrated color management. So disregarding if you want to shoot a low budget TV series or Martin Scorsese’s next big Hollywood feature, you can configure an ALEXA for the task at hand. 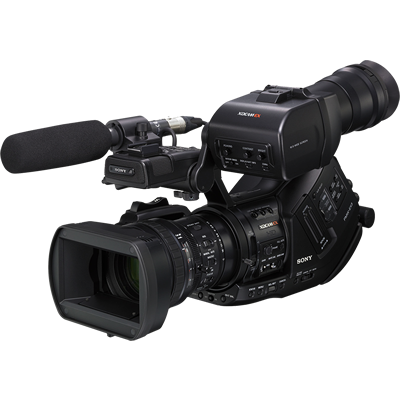 The Sony PDW-F800 XDCAM HD422 Camcorder provides the durability and reliability professionals have become accustomed to with their full line of ENG camcorders, while adding many new features. What sets the XDCAM HD422 line apart from other cameras is the ability to shoot high definition video at manageable bitrates, without sacrificing quality. 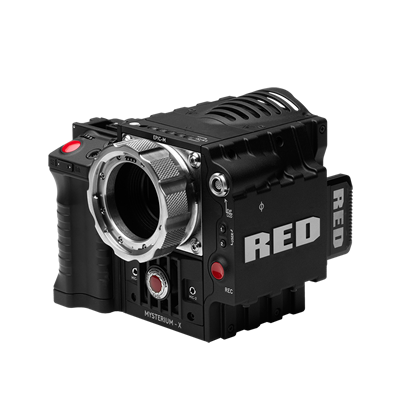 Equipped with three 2/3" HD CCDs, the PDW-F800 is capable of recording a 1080p stream at different frame rates and bit rates, giving the user increased versatility to choose between quality and run time. The camera can also under and over crank, between 4 and 60 frames, which can be used for fast and slow motion effects. The XDCAM series takes recording to the next level, utilizing non-linear single and dual-layer optical Blue Laser technology. Less time logging, capturing and digitizing footage allows videographers to move seamlessly between acquisition and post-production. Increasing efficiency results in shorter production times leading to higher profitability. The Canon EOS C300 Cinema EOS Camcorder Body takes what professionals love about DSLR filmmaking – access to a vast selection of widely available lenses, a large sensor that facilitates a shallow depth of field, and portable operation with a modular, compact camera – and addresses its shortcomings. That means that unlike DSLR cameras, this Cinema EOS camcorder is designed inside and out for professional cinematographers capturing motion pictures that will stand up to rigorous post-production processes. The EOS C300 features an EF mount for compatibility not only with Canon's existing broad range of DSLR lenses, but also with the burgeoning line of EF Cinema Zoom and Prime lenses. These lenses are designed to match up perfectly with the 3-perf Super 35mm-size CMOS sensor that Canon developed for this camera. Like the camcorder, these lenses were developed specifically for digital cinema, with engraved markings on angled surfaces in meters and feet and uniform front diameters for easy lens switching without having to reconfigure a matte box or follow focus gearing. The Canon Super 35mm sensor is paired with the Canon DIGIC III image processor, which uses an innovative method of breaking out red, green, and blue data to enable color performance on a level that would otherwise require three separate chips. Recording HD formats to CompactFlash cards as the XF codec – at the highest level a 50 Mb/s, 4:2:2 MPEG-2 format – the C300 records motion video that reduces the jagged edges and Moiré patterns that can plague video with 4:2:0 chroma subsampling and lead to post-production challenges. Moreover, the files' MXF wrapper brings together video, audio, metadata, and timecode in a package that enjoys robust support from all professional NLE programs. The EOS C300 is designed to capture footage that thrives in the post-production suite. To that same end, the camera also offers Canon's Log gamma mode, which results in excellent tonal reproduction in the highlight and lowlight regions of an image, and a greatly expanded dynamic range. The exterior of the camera is as unique as its innards. Featuring the expected HD-SDI output, timecode I/O, and genlock input BNCs, the body is a modular creature that can either be stripped down completely, or be built up to host the included handle, 4" rotating LCD unit with full controls, grip, and thumb rest. 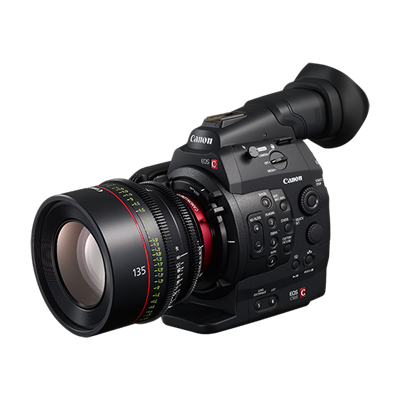 With accessible buttons and ridges dividing them, the C300 is physically designed not for still photography but for the craft of digital cinema.